After many sleepless nights. after many declined party invites, and endless sales email drafts, something special came into this world. That was actually the easy part. Next comes selling it. Ah selling. The 7-letter word that strikes terror into the hearts of many business owners. But you know who really has it tough? The Donald Drapers of this world who work in industries where they have to meet with every single prospect and drink and charm their way to closing the deal. If you sell your product online, you don’t have to meet your prospects at all. Nor would you have to wipe the sweat off your hands after catching a flicker of doubt in their eyes. You can sell in your underwear. While you’re sleeping. While you’re out having fun. How? By selling to your email list. The secret weapon powering all of the most successful online product sales and launches. If you don’t have a big email list yet, hop over to my article explaining how I grew my email list by 3X in 3 months. If you’ve already have a lot of peeps who invited your emails to their inbox, congrats! You can skip right over to the next step: nurturing all of your current and future subscribers into paying customers on autopilot. How? 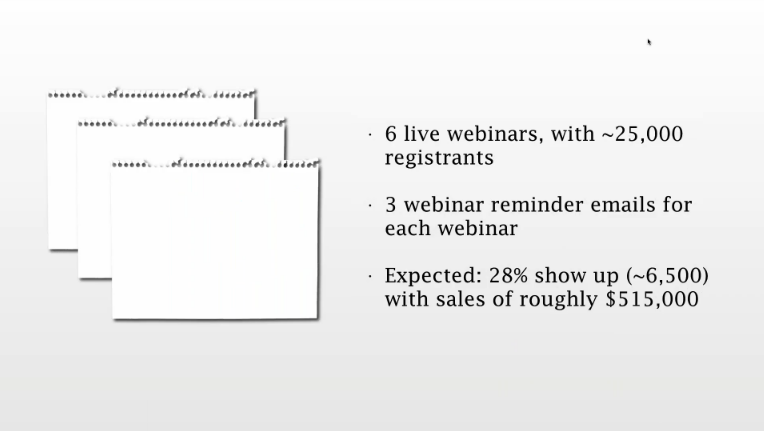 By writing a few sales emails, setting them up in your email marketing platform and sending them on a preset schedule. Of course the stuff you say in these emails matter. Which is why the rest of this article exists. Let’s get started! If you’d like to jump to a specific section be my guest use the table of contents or just read along like you normally would! It’s a good read. 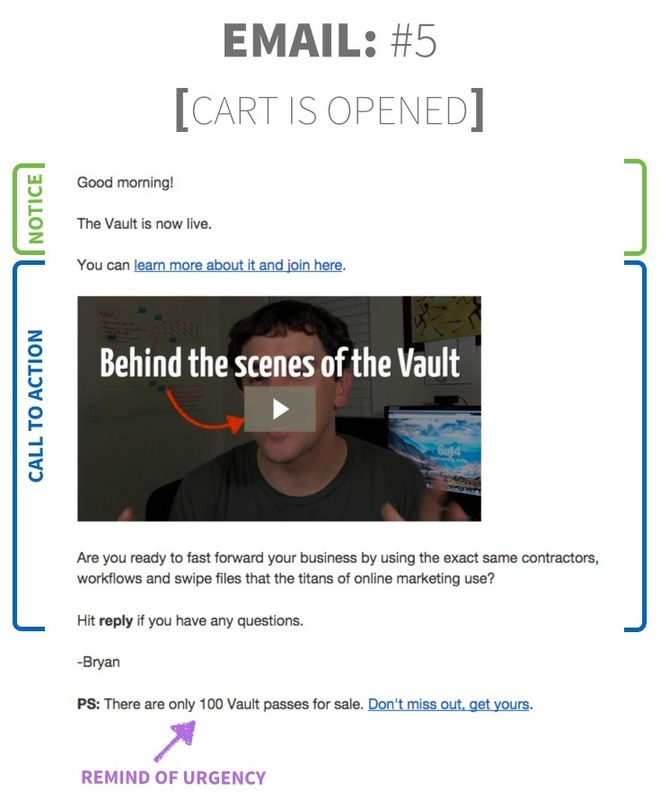 First, let’s walk through how to write a compelling sales email. A. Start by deciding which action you want your subscriber to take after reading your email. Is it to click on a link? Is it to reply to your sales email? Or is it to buy something? Write the call to action for that first so you have this goal in mind when writing the rest of your email. B. Use an irresistible hook to open your sales email. Our brains are wired to pay attention to what’s new and exciting and to ignore what we’ve already seen a hundred times before. So by saying something weird or funny or interesting in your sales email’s opening lines, you compel subscribers to sit up and pay attention. My 5 year old son and 36 other little people escorted by 7 adults. Me and 6 Mums. As predicted I was the only Dad. Apparently Dads are less likely to take time off work for school trips despite the fact that most of the Mums took time off work for a school trip…. Bunnies, sheep, goats, birds, butterflies and an 800kg crocodile called Scar. Here’s how Joanna from Copy Hackers opened her sales email asking subscribers to join her Copywriter Mastermind. Notice how it doesn’t mention what she’s selling at all in the beginning? Instead, she uses the story of Don Draper and his drinking as a set up for her punch in your face twist: nope, copywriters don’t drink to look cool. They drink to drown their self-doubt. A self-doubt her mastermind will vanquish. This is for you, you cunning trickster, you. We used to be friends, Don. At least to the degree that one can fall in love with a fictional antihero. You took your game of deceit a little too far. None were as hurtful as the one you played on members of your own ilk. C. Write the body of your email, using a mix of different psychological principles to convince your audience why they should take the action you ask them to right now. A. Every new sentence should start on its own line. I’m the founder of JustReachOut ‘” helping entrepreneurs forget PR firms and pitch press on their own. I am a contributor for Entrepreneur, TheNextWeb and TechCrunch. I’ve also written for Mashable, Huffington Post, WIRED and many others. Why? According to a May 2016 Litmus study, 54% of recipients open emails on their mobile phones. So even by including as little as 2-3 sentences in a single block, it looks like a lot to read on a small screen. B. Don’t use a call to action until your copy has made your audience ready for it. Your copy has to educate, entertain and emotionally stir your prospects on the benefits of taking action before you can ask them to do it. Ask too early and you may get the reaction: “Why should I?” Then they may check out of your sales email entirely. C. Don’t ask your audience questions they may answer no to. When posing questions related to the value of your product or the importance of taking a specific action, make sure you only ask ones you can be confident most of your audience would say yes to. When in doubt, avoid phrasing your point as a question. When your audience mentally disagrees with something, they subconsciously become less receptive to everything you say afterwards. 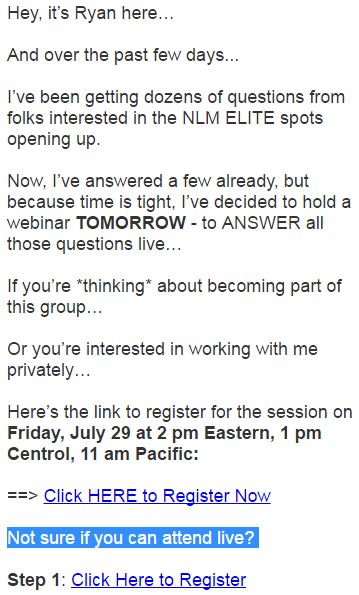 Here’s an example of a sales email Ryan Levesque sent inviting his subscribes to a Q&A call with him. Notice how the only questions he asks are ones related to whether or not one can attend his call. He doesn’t ask any questions related to the value subscribers would get out of attending it. D. Don’t ask your audience to take more than one action in in one sales email. The paradox of choice. The more choices you give your audience, the less likely they are to take any action at all because now it’s that much more work for them to decide between all these options. Focusing on one action you want your subscriber to take will also make your copy that much more powerful because it won’t have to connect the dots between separate topics. Here’s an example. See how Marie doesn’t ask subscribers to take any other action except watch her video and leave a comment? In your email marketing platform, set up a rule so that depending on which link a subscriber clicks inside this email, they’re automatically added to a new list. For example, if they click on SEO, they can be automatically added to a list called ‘Subscribers interested in SEO’. Then in the future, if you plan to send a sales mail about SEO, you can send it only to that list instead of the general list containing all your readers. This keeps the content you sent out interesting for all different types of subscribers so they keep opening and reading your future emails. This gives you more chances to gain their trust in your product value. This way you can get valuable feedback about the problems your users are trying to solve and the goals they want to achieve related to your product. So you know which product features you should spend more time developing and how to better frame your product value to future users. Make sure your welcome email is written as a really personal message from the founder of the company. This way, it’s easier for new users to connect with and trust your company, knowing there’s good people working behind the scenes. When launching a product to existing subscribers or nurturing new subscribers to buy your existing products, you can send a series of emails to convince them to eventually buy. This is much more effective than simply asking for the sale within a single point of contact since you get several chances to explain your product’s benefits, to address prospect objections and to share success stories. To create a compelling sales email sequence, think about what type of customers gravitate toward your product. – Would they a skeptic (will your product work for me)? – Would they be a number cruncher (how will your product help me save money or make money)? – Would they be a dreamer (how will your product help me achieve my aspirational lifestyle)? Then consider the thought process these customers typically go through before deciding to buy your product. In each email in your sequence, focus on addressing a specific thought or objection your prospect would likely have. 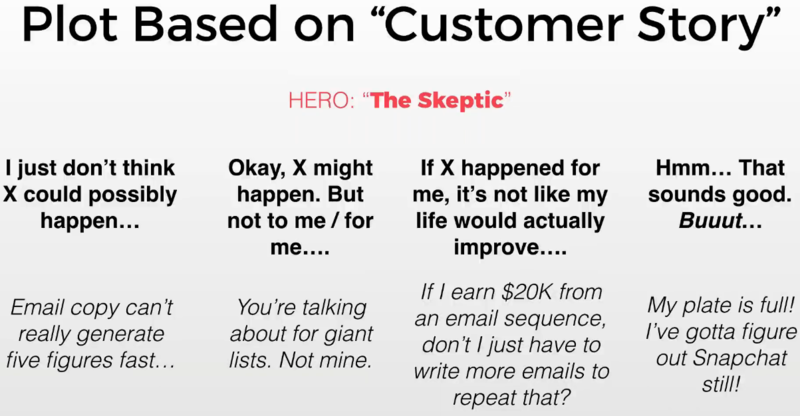 For example, let’s say you sell an email tracking tool and your customer persona is skeptic. A. Prospect thought: I have no clue what’s happening to my emails after I click send. Did the other person read it? Did the other person click on any of its links? 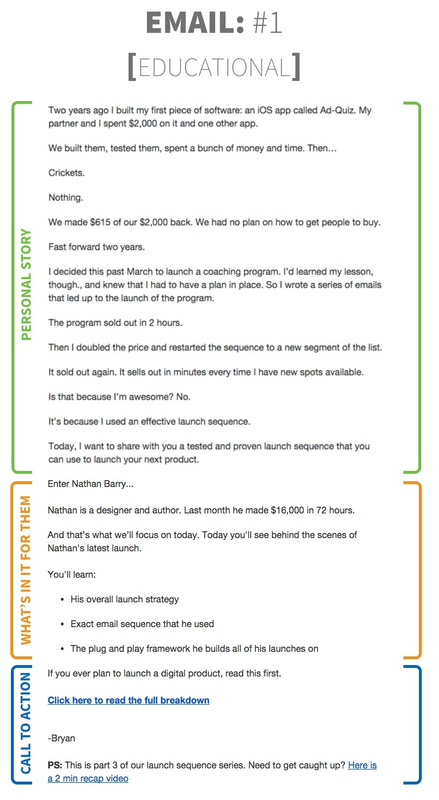 Email #1: Talk about how easily and effectively your product solves these problems. For example: Never wonder again what’s happening on the other side. 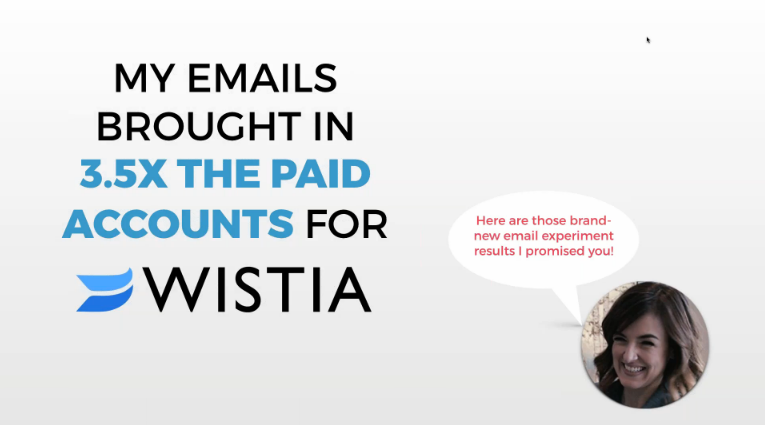 See exactly when your prospect opened your email, where they did and how many times they did. Like you’re looking over their shoulders! B. Prospect thought: Finally, I know if my emails are being read and how many times they’ve been read. But what do I do with this info? 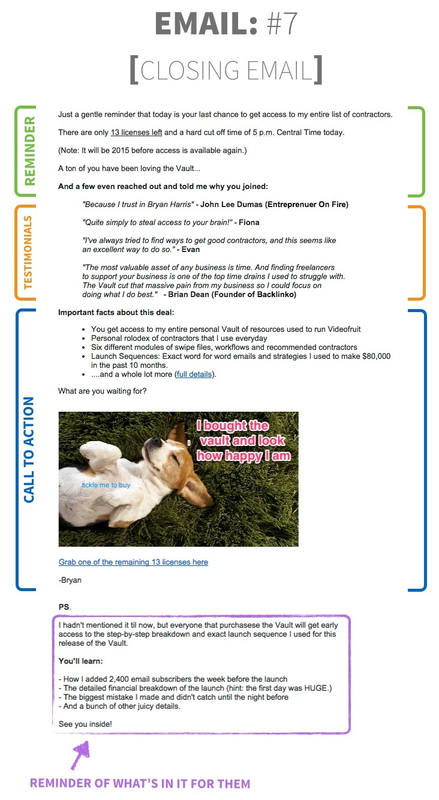 Mail #2: Provide specific examples showing how they can use your product to achieve their goals. Let’s look at an example: Saw that someone opened your email a few times but never responded? Chances are they were interested in what you had to say but got too busy to reply. You can send a short follow up email to get back on their radar. C. Prospect thought: Ok cool, but does this actually make my life significantly easier? Email #3: Describe a few of the biggest time saving headache reducing benefits the prospect will get from using your product. Example: With email tracking, you’ll be able to see what subject lines and email content consistently get opens and replies. Then you can turn those into proven templates to use again and again. D. Prospect thought: Yeah but why should I buy right now? Email #4: Provide an incentive for your prospect to buy right now. Example: By upgrading today, you get 10% off our yearly plans. And one of our copywriters will help you rewrite a few of the emails you send often to get more opens and replies! You don’t need to be the next Hemingway to write high converting sales emails. You can get solid results by simply learning from other copywriters who have already written hundreds of them and take inspiration from the subject lines, styles and structures that worked best. To get started, use proven sales email frameworks like the ones I provided above and plug your personalized content into them. After doing this for a while, you will internalize the basics to be able to write something new and exciting for your audience completely from scratch. 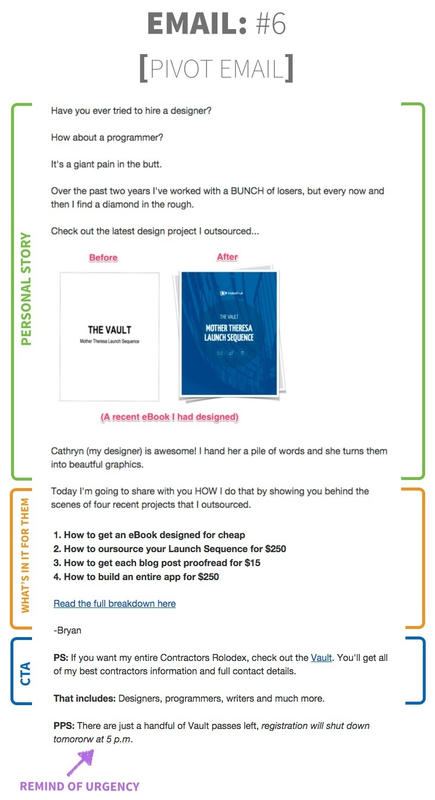 What’s great about learning email copywriting as a skill is, you can deploy again and again to generate sales. The lifeblood of any business. And the psychological principles behind copywriting can be applied to all forms of communication. So expect to be hearing a lot more yes in all facets of your life!